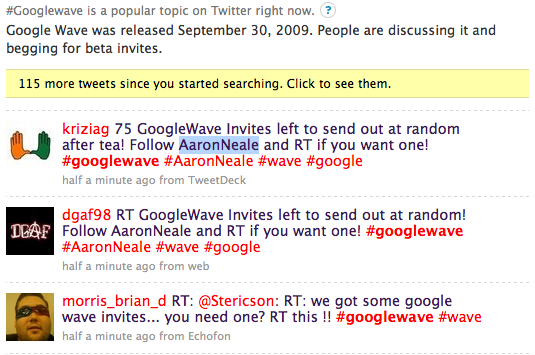 Google wave preview invites were sent out today and I had got one, and the craze to crave for an invite by everyone is such that most of them are falling into the hands of scammers and just wasting their time expecting an invite from people who are just promising the invites for some service/payment done for them! Twitter is full of wave business, where people are trying to get loads of followers promising wave invites which is not possible right now, as the invites are not instantly sent and there are just 8 nominations given to every member who has an account. The nominations would be accepted by Google some time later and the invites would be sent. Fake invite promises and contests! 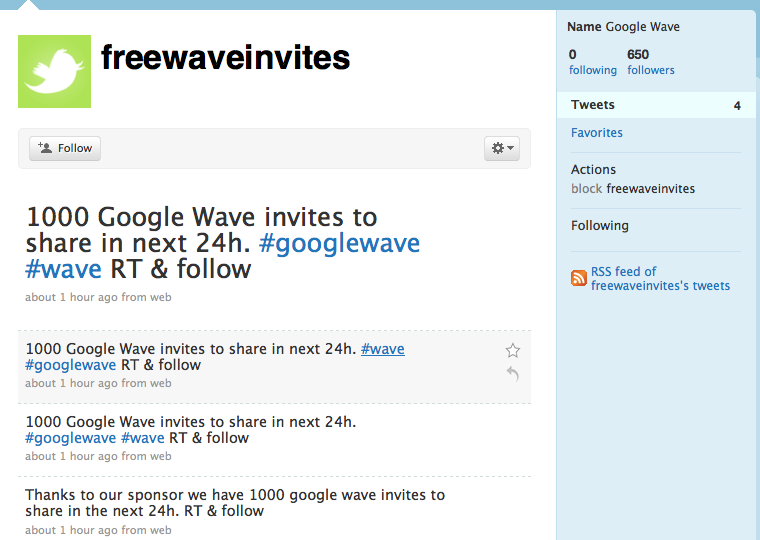 Here is a website dedicated just for Google wave invites, another big fail. Ask a friend who can actually send you an invite if he has any available, and don’t just ask someone who wants you to do something for the invite, which won’t be sent ever! Also, if you already have a wave account then it would be good if you send a couple invite nominations to any other gmail accounts of yours, so that you can have more invites in the near future and actually help your friends with more invites! And btw I have got a few invites, and my brother Amit Bhawani too has got a few Google wave invitations, for which the nominations would be sent for selected people. So just had to tell be Patient and try your luck that’s it! Here are a few Google wave tips and tricks for those who have the Google wave account and need some tips on how to get going! would definitely love to get my hands on a google wave invite, and despite having signed up months ago, i was disappointed to see that i was not one of the Chosen. Invite me please bface2psi@gmail.com, I’m signing up as a developer too. Hook me up with an invite please! Would be grateful for an invitation 🙂 even if no, great post, thanks :). A friend of mine sent me an invite, but I haven’t received it yet. Do you know how long it’s taking people to receive their invites from friends once the friend sends it? I read in one of the Google discussion threads that it can take more than a week for the invites to be sent, as Google doesn’t call it an invite right now. Its still a nomination given by your friend, not sure when Google would accept it as an invite to be sent out. Ahhh, that explains a lot then! Thanks for getting back to me on that! Hi there! Can you spare a google invite please. I really to try it out. Thanks a lot! Have you an invite! it’s urgent! my self being patient Patient and try my luck that’s it!